Why hire covered car transport for classic cars and sports cars? We all know that not all cars are the same – there’s a world of difference from a Bentley or Bugatti to an old banger or family hatchback. So when it comes to transporting your pride and joy, it’s well worth considering covered car transport for classic cars and sports cars, rather than leaving them open to the elements on a typical car transporter. Covered car transport keeps sports cars and classic cars out of sight and out of any heavy weather they encounter en route – while getting them to their destination without clocking up any extra miles under their own power. Here are some of the best reasons to use covered car transport for classic cars and sports cars. Even if you drive your car regularly, it’s still worth keeping unnecessary extra miles off of its total mileage to preserve the engine for longer, and to preserve its resale value too. The investment you make in hiring covered car transport for your classic car will pay off in the long term by preventing expensive maintenance and depreciation in value. Covered car transporters keep vehicles protected against bad weather – but also against good weather too, as exposure to direct sunlight can cause paintwork and even interior upholstery to fade prematurely. This makes covered transport for sports cars a good idea all year round, and not only when the forecast is for bad weather. Being inside a covered car transporter is like a suit of armour for your classic car, protecting it not just against the weather, but also against the common road risks that can chip paintwork and crack windscreens. These include grit kicked up off the road surface by vehicles in front, along with road salt used in the winter months, which can be damaging to the underbody of the vehicle. 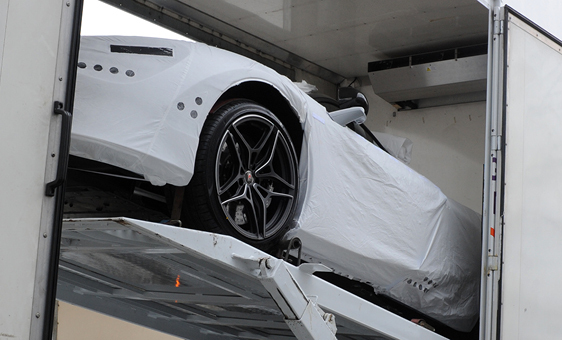 Putting your vehicle into covered car transport keeps it away from prying eyes while it’s on its way to its destination, so you don’t need to worry about who sees your sports car while you’re not with it. At Ontime we go even further than this though, providing a complete end-to-end service, and can even coordinate transport through multiple countries to make certain your car arrives safely. With our expertise and experience and our state-of-the-art covered car transporters, there’s no need to worry when we move your classic car or sports car from A to B. We also have substantial insurance. Of course we aim never to need this, but if an incident should occur en route, it means you have that extra final layer of protection. To find out more about Ontime’s covered car transport or any of our vehicle transportation services, give us a call on 01295 770040 or fill in our online contact form with the details of your enquiry and we will get back to you as soon as we can.